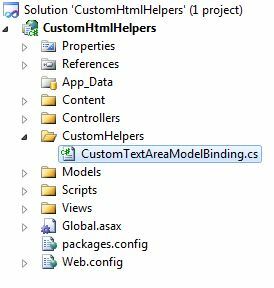 In this article we will create Custom HTML helper for TextArea with Model Binding to render TextArea. We have created a separate folder named CustomHelpers to hold Custom HTML Helpers. We have created a class named CustomTextAreaModelBinding.cs which will contain code to render TextArea. //Creating a textarea tag using TagBuilder class. Overload 1 : The first overload accepts linq expression as parameter. This method is extension method and accepts object of HtmlHelper class. 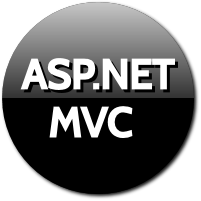 The first parameter adds this overload to System.Web.MVC namespace. On view we can access this method using @html. This overload in turn calls another overload. The propertyName is used to set the name attribute of the control. We have used TagBuilder class to create TextArea tag. We have also assigned other attributes passed using htmlAttributes object. The Model value is fetched if present and assigned to textarea's innerHtml property. The entire control is returned as MVCHtmlString format. We have created an Address property in ViewModel. We will bind our TextArea with this property. In the About Action method, we have created object of Register class, assigned value to address property and we have returned the View with this ViewModel object. This is how we can create our own Custom Helper to render TextArea with Model Binding. Nice example on how to create Custom Helper for TextArea control.